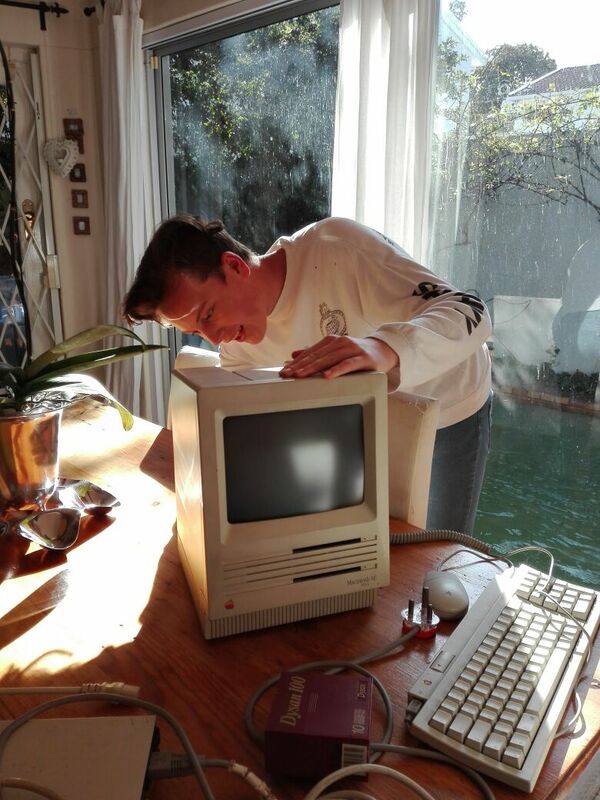 I bought my first Apple Mac from Cash Converters for R200. Before this, all of my Apple experience was with the Apple ][+, and I didn't know squat about Macs. This one turned out to be a bit of a mystery. The case is marked Mac Classic II (M4150, CK2040HVD15), but the motherboard is the standard 68000 Classic (M0420). It came with 4MB RAM and a 40MB Quantum hard drive. How to format the hard drive. The first is not too much of a problem, since the Mac Classic has a 1.44M floppy drive. Older macs used the 400 and 800k drives with Woz' special RLL encoding, which can't be accessed by anything except a Mac. You'd have to "bounce" through a Mac that can read 1.44M floppies and write 800k ones -- which would be an SE FDHD or newer. OK, first things first. You need a system disk. System 6.0.8 is probably the best for a Classic Mac. I downloaded two files from Apple, but these are no longer there. Fortunately archive.org saved a copy, SSW_6.0.8-1.4MB_Disk1of2.sea.bin and SSW_6.0.8-1.4MB_Disk2of2.sea.bin. Drag-and-dropping these files into Aladdin Expander 5.1 (ALEX511.EXE) gives two .sea files, and repeating the process gives two files with no extension and length 1 474 644. I opened these files using Cygnus Hex Editor and chopped off the first $54 (decimal 84) bytes, save as .dsk (1 474 560 bytes long). These .dsk files can be written to stiffy using HFVExplorer 1.3.1 (hfvexplorer131.zip). You can also use VMac to manipulate files inside the .dsk images before writing the .dsk to disk. Start with a blank disk image and use HFVExplorer (which is a complete PITA to use -- navigate to your file(s), Edit/copy, File/open volume, Edit/paste, then close HFVExplorer to close the disk image). You can then use WinImage to write the .dsk to disk. I used Lido 7 and it works well. If you open lido756.hqx with HFVExplorer (copy it from your PC drive to one of the virtual volumes), you will end up with a lido7.56.sea file. Double click on this file in VMac (or I guess on a real Mac :-) to extract the archive. The Mac Classic has 1MB on the motherboard, and a space for an expansion card with another 1MB soldered to it, as well as space for two SIMMs. My Classic came with 4MB of RAM installed. This is also the maximum, the (stupid, IMO, but hey, hindsight is the only exact science) reason being that the ROM is mapped at $400000. 2004-02-02: I bought four Macs for R300. The Mac Plus was sold with 256K of memory, but mine have been upgraded to 1MB (4 SIMMs total). 2011-11-10: I was looking around for Macintoshes and found two more. No idea where I got them from. They're just... here. Strange. Anyway, the first is a Macintosh M0001P (128K, 220V), with jumpers for 128k or 512k on the motherboard, which means it's the somewhat later motherboard in the early style case. Opening it up shows that someone's been here before me, the floppy cable is missing, The RAM has been replaced with 256 kbit devices to give 512 kbyte instead of 128 kbyte, the serial drivers and ROM chips are in sockets, and the ROMS are 27C512 EPROMS labelled "Rom Lo 0AE0" and "ROM HI C818". This Mac has a Hitachi 68000 processor. The second is a Mac SE "FDHD", except it's fitted with two floppies, no hard drive, nothing in the expansion slot, and 1 MByte of RAM. It also has mismatched ROMS -- The high ROM and the low ROM are from different manufacturers. 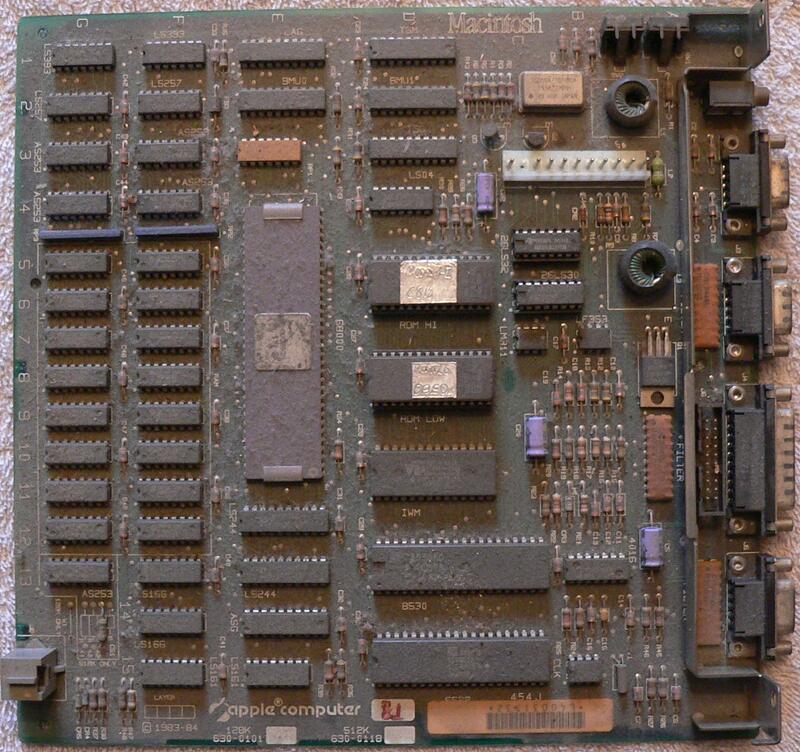 While the original Macintosh had 128k RAM, the motherboard design (see schematic) allowed for 512k. Upgrading the 512k "Fat Mac" needed a redesigned motherboard. 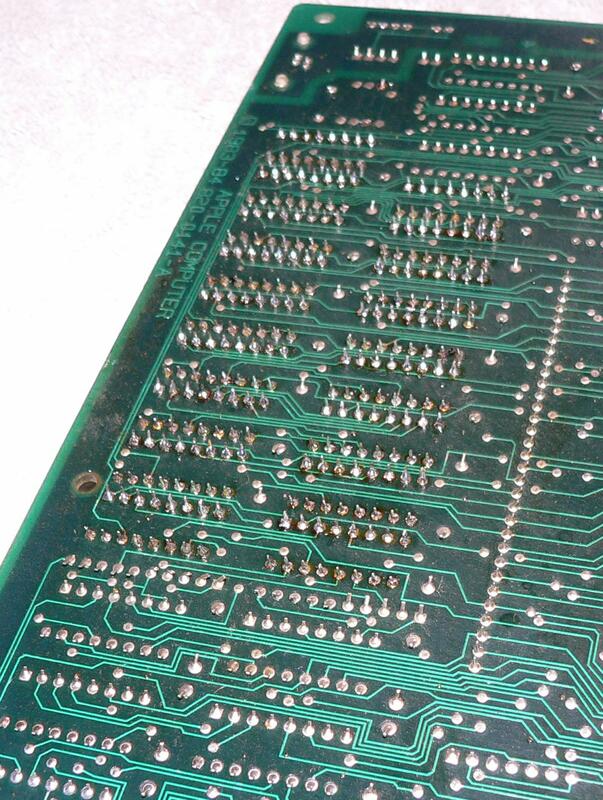 This was the "Plus", with 1MB on the motherboard, which could be expanded to 4MB (Scans of PCBs). 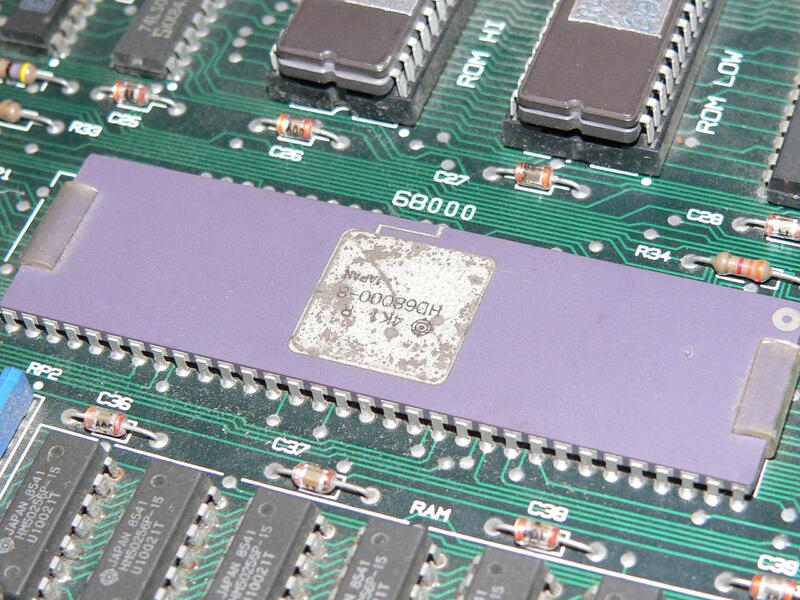 The original 512k design and the Plus makes extensive use of PAL technology. See http://www.mactech.com/articles/mactech/Vol.01/01.11/PAL/. Kryten Droid (http://homepage.ntlworld.com/kryten_droid/) has had some info on what's inside the PALs. Fortunately I have a backup. ASG  16R8 Disk speed control, sound generator. TSG  16R6 Divide by 2, divide by 4.25. Datasheets at Texas Instruments: 16L8, 16R4, 16R6, 16R8, 20L8, 20R4, 20R6, 20R8. The Plus uses 9 bit SIMMs, while the Classic uses 8 bit SIMMs. 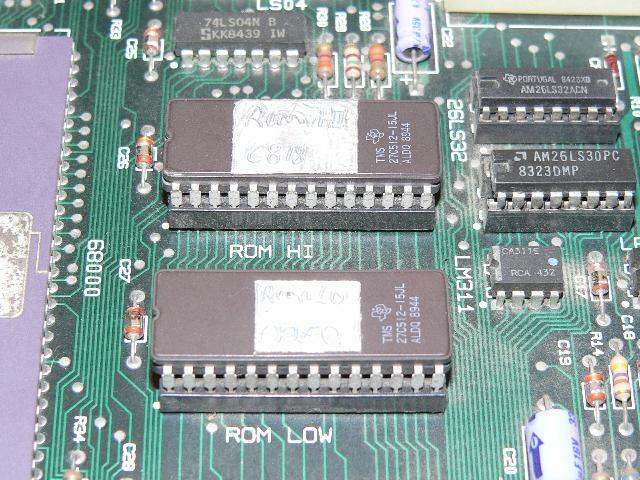 ROMs in my Plus are 342-0341-C (hi) and 342-0342-B (lo). Read these using the settings for 27C512. The Classic is a Plus using surface-mount technology on a smaller (half the size) motherboard (Scans of PCBs). The six PALs are replaced by a gate array from VLSI (UI4, BBU) and one PAL (UL1, CAS PAL). A fan was added, presumably because of the extra heat from the internal hard drive. The ROM is a 40 pin 16 bit device from Sharp. The Apple part number for the ROM in my Classic is 341-0813. The pinout matches the Amiga ROM, which is a Macronix MX23C4100. If you want to read your ROM using a programmer, use the settings for the 27C400. 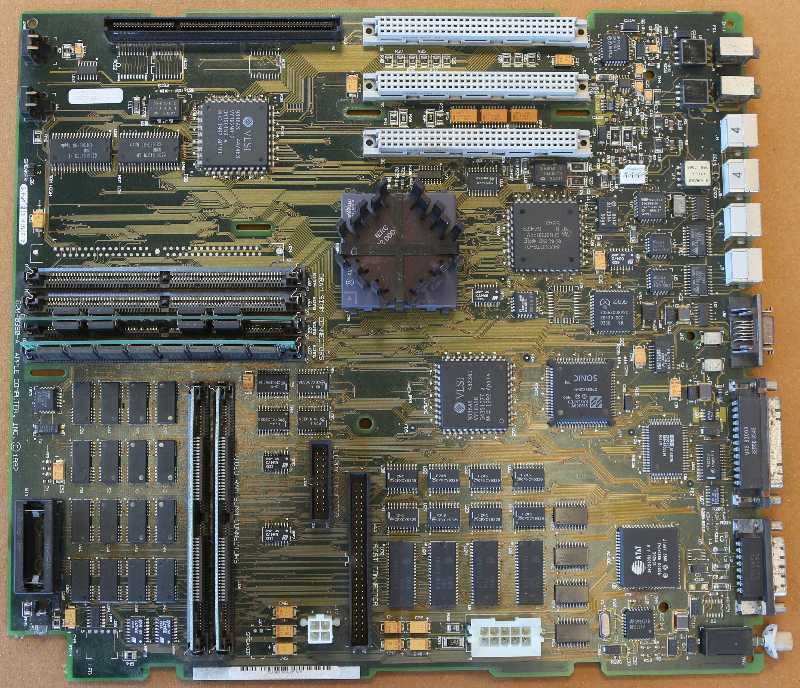 The two motherboards I have are 820-0390-03 (1990, Assembled in Thailand) and 820-0390-B (1990, 1991, Assembled in Ireland). The only differences I can spot are in the silkscreen. The same components are used in the same places and as far as I can see the board was not rerouted -- all the tracks are identical. I got this from a fellow who moved to the UK, back in 2007 . 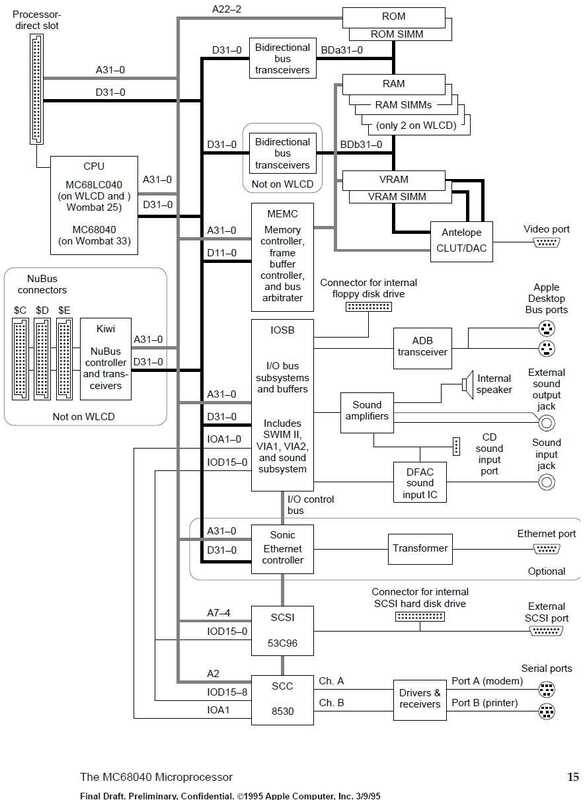 Here's a block diagram from the Centris / Quadra Developer Note. Note the "Wombat" amd "WLCD" code names. Referring to the picture of the motherboard above (open it in a new window), at the top left is the Processor Direct Slot (PDS). 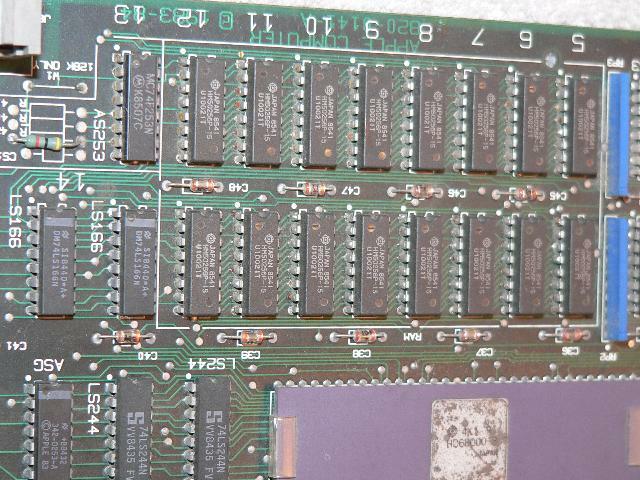 Below that the two ROMs (The Quadra 650 has no provision for ROM on a SIMM) and the KIWI Nubus Controller. To the right of that, the three NuBus connectors. 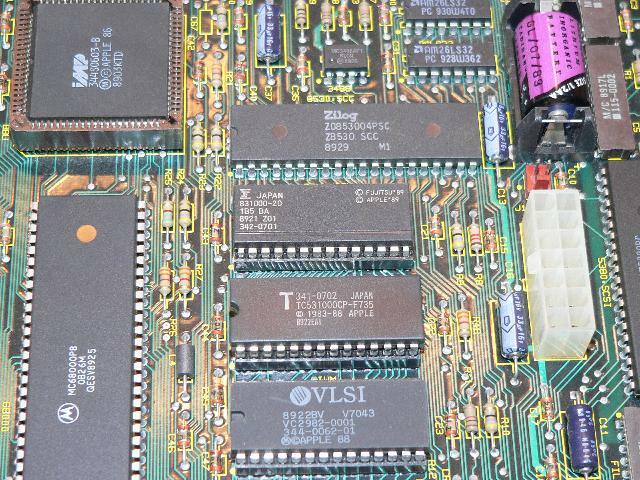 The big chip with the heatsink is the 68040, to the left of it, four RAM SIMM slots, to the right, the IOSB (includes the SWIM II Floppy Controller, VIA serial controllers and presumably more). The bottom left corner is dominated by the on-board RAM, but the RTC is also there (U63). The two vertical SIMMs are video RAM, The two big chips below the 68040 are the djMEMC which seems unique to the Centris/Quadra 610/650/800 and the SONIC Ethernet Controller. There's also a 53C96 SCSI Controller and the Antelope (says "AC/DC" on the PCB but it's marked 984S4743 it's marked 984S4743). Macintroid -- beware annoing popup advert alert! Jon Sharp writes a new bootstrap loader for the mac. The linux-m68k guys have a lot of information on the Mac hardware. Reverse Engineering the Radius Full Page Display Card. Use an LCD VGA monitor with your Mac. 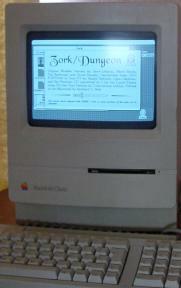 Apple Macintosh before System 7. Technical Specs at Apple (and the rest of the legacy technical notes). Table of ROMs for the different MAC models. Information on UNITRON (Mac clone) hacking in Brazil (was http://www.lsi.usp.br/~jecel/mac512.html), and pictures of the Unitron motherboard.